Often you want to iterate over a series of pins and do something to each one. 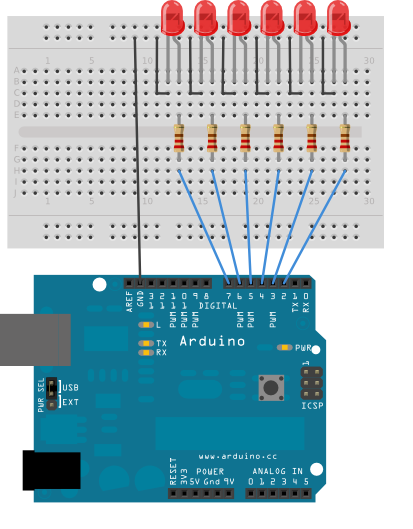 For instance, this example blinks 6 LEDs attached to the Arduino or Genuino by using a for() loop to cycle back and forth through digital pins 2-7. The LEDS are turned on and off, in sequence, by using both the digitalWrite() and delay() functions . 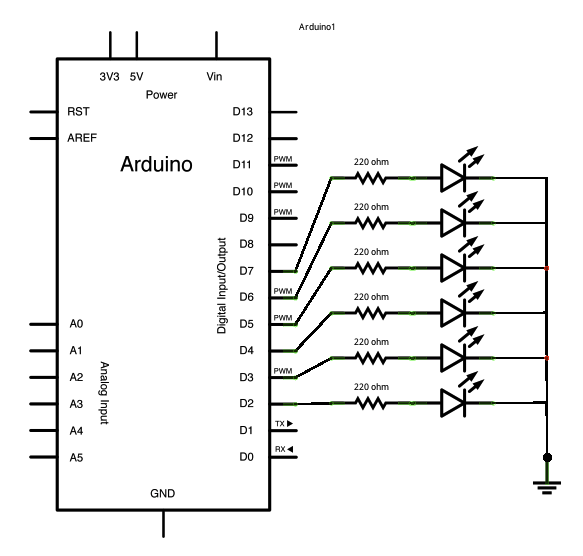 Connect six LEDS, with 220 ohm resistors in series, to digital pins 2-7 on your Arduino. The code below begins by utilizing a for() loop to assign digital pins 2-7 as outputs for the 6 LEDs used. In the main loop of the code, two for() loops are used to loop incrementally, stepping through the LEDs, one by one, from pin 2 to pin seven. Once pin 7 is lit, the process reverses, stepping back down through each LED. Arrays - A variation on the For Loop iteration example that demonstrates how to use an array.